The question should be, "What do they smell like?" and I'm sure that most already know. But if you have not had that experience you should feel blessed that you haven't. 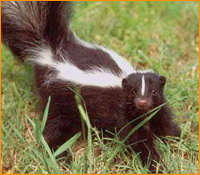 A defense mechanism for a skunk, its odor, is just as distinctive as it black and white appearance. Skunks are similar in size to the common house cat normally weighing 6 to 10 pounds. They have pointed snouts and small, triangular heads with a white stripe on their nose and forehead. Normally their coat is black with a white stripe running down the middle of their back and splits into two stripes down a skunks tail. On occasion skunks can be predominately white called albino skunks. A skunks tail is wide and bushy and can be completely black or vary in the amount of white stripes that run down the tail. Skunks have short legs which causes their noticeable waddle and categorizes them as poor climbers. Although skunks have short legs they have rather strong forefeet and long nails making them excellent diggers. It is possible that a skunk or skunks become trapped and if they cannot dig another way out they will certainly die under your home or affected structure. When a skunk does become deceased the muscles that, holds in the oil which produces the dramatic odor, releases allowing the oil to leak out and cause a constant and overpowering smell from the skunk. Understanding that skunks burrow very deeply and out of reach of predators and animal control officers justifies the difficulties that might follow for dead skunk removal. Deodorizing services will help but the source of the odor almost always needs to be found and removed. *It is significantly easier for a live skunk to walk out of its den and be trapped by a professional that it might be for a professional to become trapped in a skunk den. If you have a skunk problem and want to eradicate it yourself your best to consult a wildlife pro.